WOULD YOU BE PREPARED IF A WILDFIRE THREATENED YOUR HOME? Wildfires destroy hundreds of homes in the U.S. every year. Can you imagine how frustrating it would be to anticipate a wildfire moving through your neighborhood and knowing that you have a swimming pool with 10,000 to 30,000 gallons of water sitting there with no way to use it to save your property? YOUR POOL IS EQUIVALENT TO 50 FIRE TRUCKS FULL OF WATER! Protect your home and valuables with the water stored in your backyard swimming pool. Your pool is like a fire truck always on the scene ready to protect your home from a wildfire. You will no longer be dependent on the fire department arriving in time to save your property in the event of a fire. 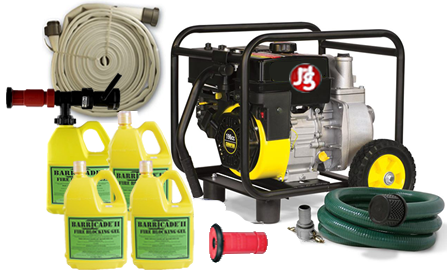 Due to the spread of wildfires around the country, we are offering a complete portable fire pump cart and fire hose system that can be ready in a moments notice. Comes with everything needed for easy installation. Specially Designed to be installed on your swimming pool plumbing using your existing pump and filter. Package Includes the fire hose/reel system, 3-way valve, all fittings, glue, protective cover, and detailed instructions. The system is economical since you already have a pump that will deliver 15-20 times the volume of a garden hose. The professional fire hose and reel system is ready to use wet down your property in under 2 minutes by changing the position of the included diverter valve installed between the pool pump and filter. The adjustable nozzle is ready to use as a direct stream or a wide fan. The system is conveniently stored on the reel flush against the house until needed. It is protected from the elements with the easily removable cover. Package comes complete with the 5.5 HP gas fire pump, 100 feet of fire hose, 12 ft. of 2" Suction Hose (high quality pvc for maximum flow rate! ), all couplings and fittings already assembled, deluxe wheel and handle system for easy portability and storage, 4 1-gallon containers of Barricade Fire Gel, and Barricade Eductor Nozzle that screws right onto the 1-gallon containers. Check out this product in action in the video below. For extra protection, we offer a handful of special eductor nozzles that allow our fire pump systems to spray Barricade Fire Gel or Class A Foam. We recommend selecting a package that has one of these special eductor nozzles so you can coat your house with either Barricade Fire Gel or National Foam (Class A Foam). This is the most important component to ensure embers do not ignite when a wildfire rips through your home or property. Cleanup is easy. Both products are environmentally friendly - just rinse off. Call Toll Free 888-766-5627 for a free consultation before you buy. We have product consultants ready to take your call. We will help you select the most efficient and cost effective package with the proper hose lengths and necessary accessories to suit your property. DO I REALLY NEED THE FIRE GEL OR CLASS A FOAM OPTION? Yes! This is actually the most important component of our systems. This is the secret weapon! According to a recent Home Builder's Guide to Construction in Wildfire Zones released by FEMA: "Polymer gels, Class A foam products, and other long-term fire retardants can be applied to structures prior to fire impingement and provide greater thermal protection than water alone." Check out JJS Fire Supply being featured in America Talks Live on NewsMax TV hosted by John Cardillo on 11/16/18. 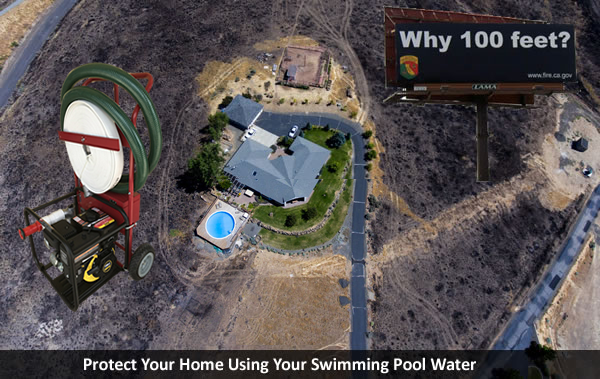 John Smullen from JJS Fire Supply shares his reaction on the California wildfires and also discusses wildfire protection systems and solutions for homeowners with a swimming pool that live in wildfire prone areas. Check out the video below from Newsmax TV on DirecTV 349, Dish 216, U-verse 1220, FiOS 615.
to the video from Newsmax TV on DirecTV 349, Dish 216, U-verse 1220, FiOS 615. JJS Fire Supply is your source for all your Home Wildfire Protection needs. We offer a variety of products including: wildfire pump and hose systems, Barricade Fire Gel, and Class A National Foam that are designed to use your swimming pool water to protect your home from the destruction of wildfires. If you are a government agency or local municipality, please call for large quantity discounts. We offer Free Shipping on all Fire Pumps. JJS Fire Supply is your source for all your Home Wildfire Protection needs. We offer a variety of products including: wildfire pump and hose systems, Barricade Fire Gel, and Class A FireFighting Foam that are designed to use your swimming pool water to protect your home from the destruction of wildfires. If you are a government agency or local municipality, please call for large quantity discounts. We offer Free Shipping on all Fire Pumps.